Rep. Rick Francis is a Republican who represents Bollinger County, Madison County and most of Perry County (District 145) in the Missouri House of Representatives. He was elected to his first two-year term in November 2016. In addition to his legislative duties, Rep. Francis is a farmer. He previously spent 33 years in education as a teacher and coach at Risco, Woodland and Perryville High Schools and served as Middle School Principal and Assistant Superintendent for Perry County School District #32. Rep. Francis retired from The Lindbergh School District where he was Assistant Superintendent for Personnel. Rep. Francis received the Coach of the Year award in 1997, and Lindbergh Leader in 2010. He attends The Church of Christ and is a member of the Elks Lodge, The Chamber of Commerce and Farm Bureau. Rep. Francis graduated from Woodland High School in 1976. He earned his Bachelor’s Degree in Education in 1980, Masters of Arts in Administration in 1990, and Specialist in Educational Administration in 1992 from Southeast Missouri University. He earned his Doctorate in Educational Leadership and Policy Analysis from the University of Missouri-Columbia in 2000. 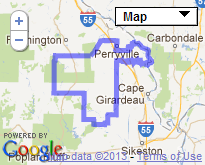 Rep. Francis was born in Cape Girardeau, MO, but grew up in Grassy MO. He and his wife Chrissy live on a farm just outside Perryville. They have four grown children: Nick (Siobahn) Zoe and Theo; Benn (Kasey) Jewel and Lincoln; Whitney (JP) Sadie; Dane.